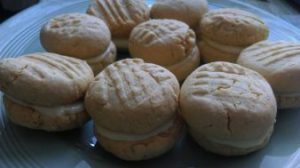 Chunky Custard Creams – Create, Make & Bake! 1. Preheat oven to gas mark 5/ 175*C/ 350*F. Mix the butter and sugar together then add the flour, custard powder and BoS, mix well ten roll into walnut sized balls and place on a baking tray. Squish down with a fork twice in a criss-cross pattern and bake for about 12-15 minutes or until firm to the touch. 2. Mix together all the ingredients for the filling until smooth. 3. Once the biscuit have cooled, sandwich 2 together with a nice amount of filling, enjoy! Previous Article Blackberry and Apple pie!